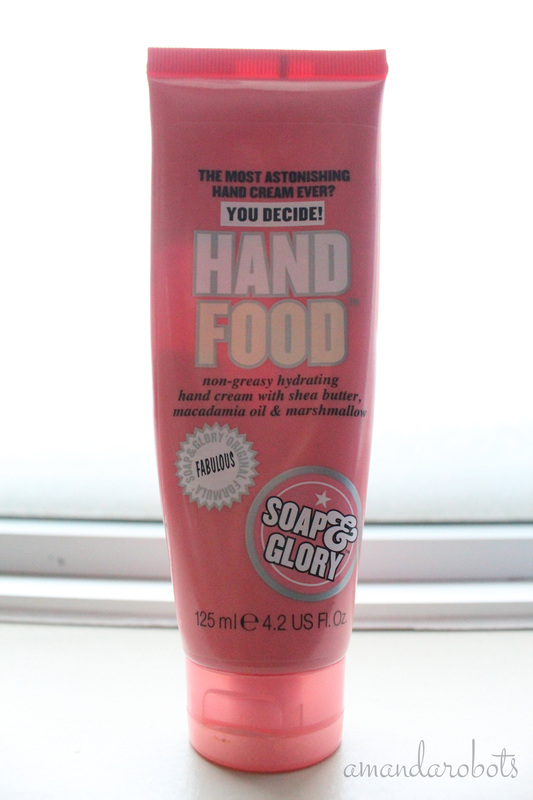 Review: Soap & Glory Hand Food – amandarobots. Marshmallow weirdness aside, I have some real mixed feelings about this cream. It delivers on its claim — it’s non-greasy and hydrating. Within seconds of application, it absorbs into the skin and doesn’t leave hands slippery. It hydrates for a really long time and feels nice on my hands. The only thing about this is that I cannot stand the smell. Unfortunately that’s stopped me from trying a lot of other Soap & Glory body products, because it’s a bit of a signature scent for them (seriously — they call it ‘Original Pink’). It’s difficult to describe; the best I can do is to say that it’s strong, floral, and seems a little granny-ish to me. My main gripe with this is that it is super strong. When I put on a hand cream, I don’t want to smell it hours later, especially if I’ve chosen to wear a fragrance that day. I don’t use this cream as often as I’d like to, especially given how good it is. Try as I might, I just can’t get over the smell. I’ve become quite motivated to finish it, though, so I’ve been trying to use it more often, particularly before bed, when the smell doesn’t matter as much!